$59.00 $25.00 You save $34.00! 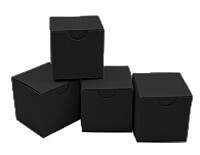 As you’ve been scouring the internet for cheap gift boxes wholesale, by now you must realize that Bayley’s Boxes is your premier source for cheap small boxes. Our packaging is ideal for any use you can dream up. Perfect for a multitude of uses, these are typically used as packaging for any small items, favors or gifts. As the world’s small favor box experts, we’ve developed a place in the galaxy for ourselves providing small boxes and packaging for a multitude of uses. The world has turned to us ever since we opened our doors in 1999 for all their unorthodox small box needs. We’ve done studies and have shown that products packaged in our cool boxes sell more than products without. Order your cheap small boxes online right now! Just like the other guys, we manufacture cheap gift boxes wholesale in plain white materials. But where we differ is by offering cool boxes in cool colors. Do you need to crank up the volume with your packaging? Maybe you need something with a rainbow’s zing. So we decided to offer all our packaging in the most extensive color selection known to man. Let’s put it another way. Our selection of boxes in neat colors can’t be found anywhere else. We offer favor boxes in colors like shimmering copper, shimmering sapphire and shimmering moss. We have matte finishes in limeade, wild cherry and even grape! So when your project, merchandise or event needs a big league jolt, consider cheap small boxes in shimmering red or recycled beach. And if you send us pictures using our great little boxes, we’ll stick ‘em on Facebook and link back to you. Neat, huh? We are a small, family owned business. Bayley’s Boxes has been manufacturing at our Colorado warehouse since 1999. We are not importers and do not import our boxes, but rather manufacture everything ourselves. This assures quality and a special feel to our cheap gift boxes wholesale. We stock all of our materials and inspect everything before it ships. All Bayley’s Boxes ship flat, store flat and include simple assembly instructions. Order cheap small boxes today and we’ll get your order shipped just as soon as we can. Most of the time orders ship within two or three days of when we receive it. We use US priority mail so often times, you’ll get your in your little box-craving hands in about a week. Occasionally larger orders of cheap gift boxes wholesale may take a bit longer, but rest assured we’ll get your order to you as fast as we can. We know you’re excited to start packaging your stuff and don’t want to wait an extended period of time to get your cheap small boxes! If you’re the type that needs to see something and feel something before you decide to buy something, we get that. You will find a sample request link on every page here and we are happy to get a sample to you ASAP so you can make your decision. We’re pretty sure you’re going to like us a lot, just like wedding planners, bee keepers and event coordinators do. We’re glad you found us and we thank you for thinking about Bayley’s Boxes in your quest for cheap gift boxes wholesale.